Undertale is a JRPG that manages to simultaneously hit several of my favorite things about video games in a single game. As a huge fan of sprawling JRPGs who rarely has the free time left to play them for fun, Undertale managed to provide me with a full scale JRPG adventure in under ten hours, mixing it in with a player choice system that ties into the narrative, a unique combat system that kept me engage, a branching plot that caught me off guard and encouraged multiple playthroughs and a sense of visual and written humor rivaling that of Earthbound. In short, Undertale was right up my alley. So, what actually is Undertale? In undertale, you play a young human child who, while walking alone in the woods, fell down into a world of monsters. These monsters apparently used to roam the surface of earth, before humanity pushed them deep underground and created a barrier trapping them below the surface. Your mission is to make your way through this world of monsters and back home. 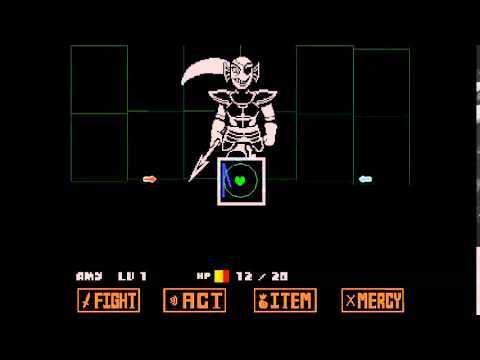 What makes Undertale somewhat unique as a JRPG is that you as the player can in theory get through the entire game without killing a single enemy. As well as your standard battle commands, you have a set of act commands which are unique to each enemy you fight and offer options to non violently interact with them. From flirting with a skeleton to rolling around on the floor and petting a dog, each fight can be played like a puzzle where perseverance can lead to a non violent path through the game. That said, a non violent path through the game isn’t easy. As well as the perseverance required to escape battles without engaging in combat, you also do not gain experience points or level up if you don’t kill enemies. This means you’ll potentially play the entire game as a level one hero, with minimal health and left wildly open to the threat of enemy attacks wiping you out. During enemy combat turns, you are potentially able to remain completely unhurt by taking part in a series of bullet hell shooter mini games. A heart is placed in the center of a small square and you use the arrow keys to move around, avoiding projectile patterns unique to each enemy type you fight. If you can avoid being hit by these complete bullet hell patterns, you don’t sustain damage in battle. Where it’s usually easy to switch off mentally while grinding in JRPGs, button mashing the attack button as you go, in Undertale you need to pay much more attention during encounters. What particularly interested me about Undertale was the way that minor choices made during gameplay really felt like they made a difference to the world I was exploring. Slaughter everything in your path and an unsettled parent may send their kids inside the house, unsure of what is looming in the distance. Pet a dog enough times and he may become obsessed with building sculptures of dogs with elongated necks. Little choices you do have small impacts on the world, which gradually build into greater changes in the way the world reacts to you. These shifts in the world feel small, gradual and cumulative, they all gently built up to make a very understandable and gradual change in the world that is fascinating to watch. In terms of the game’s wacky visual design, tone, pacing and writing, I was often reminded of Earthbound. After I completed Earthbound for the first time a couple of years ago, there was a certain hole left in my gaming life that nothing else seemed able to fill. I’m really pleased to report that Undertale really scratched that earthbound itch for me, which is pretty high praise. The writing knows when to be silly and when to be serious. The cast is over the top, until the moments where they need to step up and give a subtle, emotionally charged speech. It was an absolute joy to play through, as well as making me feel a cathartic sadness that few video games can elicit from me. 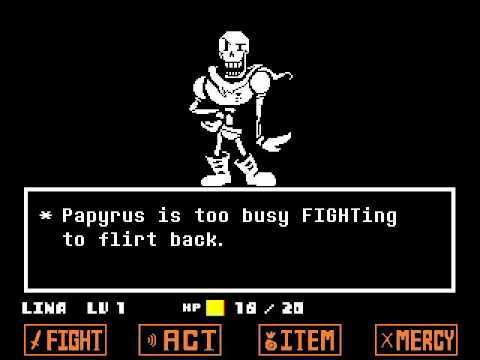 Having now finished three separate playthroughs of Undertale I feel like the game still has things to show me. The gradual changes depending on how you play it, the multiple endings that all feel nuanced and impacted by your actions, they all left me feeling like the game still has so much for me to find. Undertale is a truly fantastic short JRPG, and I really recommend everyone go and check it out as soon as possible. It has an endearing cast of memorable characters, a beautifully written plot and a truly unique set of combat mechanics. It has been a while since a JRPG has captured my heart this overwhelmingly and I have come away with it with nothing but great things to say. Undertale is amazing, end of. Now to go back to replaying it and having my heart stomped on repeatedly. The game also plays with your Save game, and shows a certain awareness when you attempt to save-scum. It’s got a manual save system, but it also has an autosave that it doesn’t directly mention. You can delete the manual saves, but to delete those autosaves, you have to actually make a reg edit to completely remove the game. This is completely intentional on the creators’ part. There is a constant under-the-surface commentary about video game universes and save games. Completing the game does not erase those autosaves, as one character in particular demonstrates on a certain kind of playthrough. This is the only time you actually can fight this character. This game does what Spec Ops: The Line tried, but failed to follow through on. YOU have choice. Spec Ops made it clear that the player was a monster for killing, but there was no other way to advance in the game otherwise. Undertale is completely different. If you don’t want to kill anything, you can certainly do so, and there are consequences, but you can continue to advance in the story to the end. This game tugs on the heart strings so well, that when I completed that first playthrough (Pacifist run), I put it down and have no intention of playing it again. Those final conversations the game has about resets and save games affected me that much. I’ll just enjoy some Undertale fanart (suggestion: @cubewatermelon on Twitter, loves Undertale).